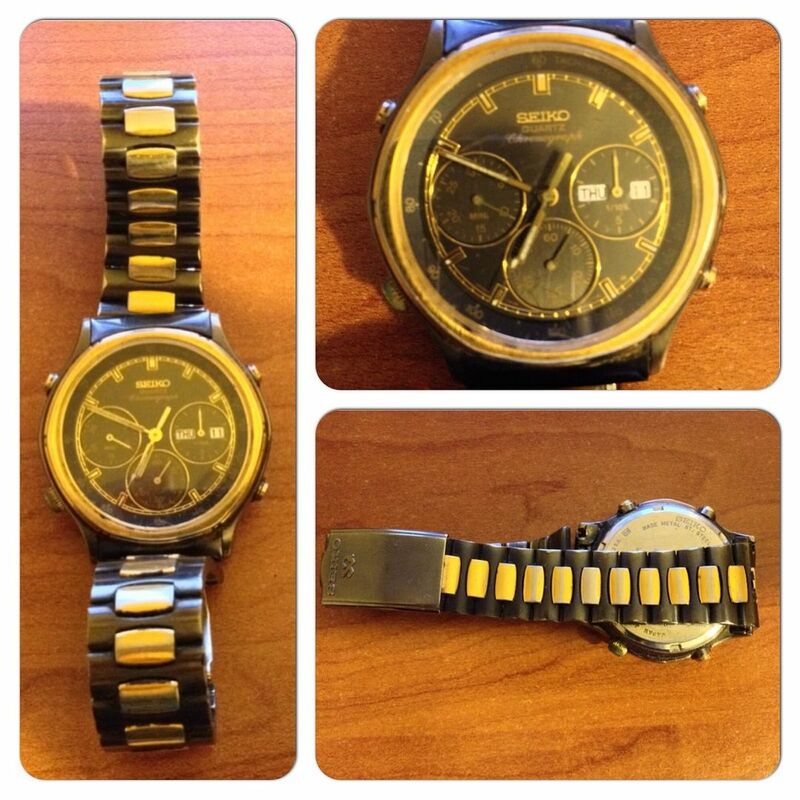 Seiko 7A38 “Battery Eating Monster” First off, I will state that this watch has ALWAYS FUNCTIONED PERFECTLY !! Except---> It has gone through 5 battery's in the last month ! 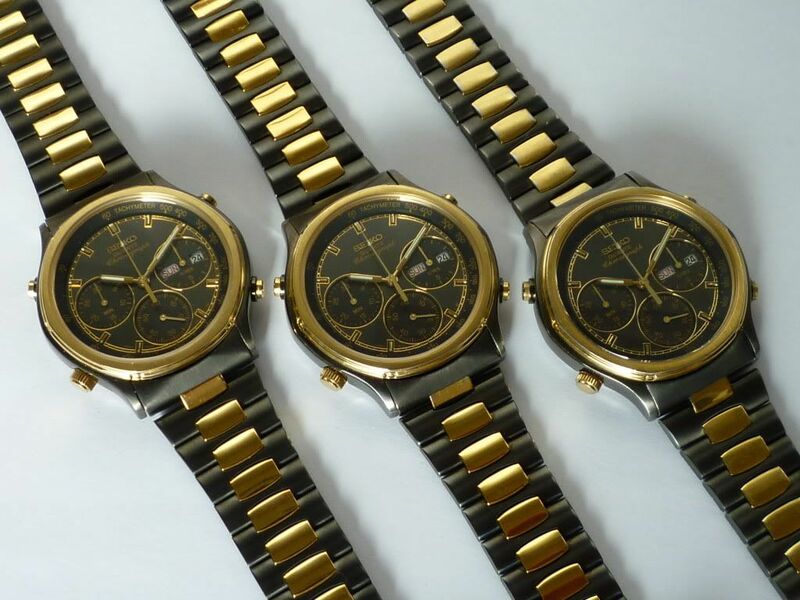 It is a watch off E bay from an Australian seller. The first battery was off my work bench and lasted two days. At this time I did not have any fresh 394's and I again installed a used battery. The second lasted 2 days again, OK what gives ? I tore down and found that there were some corrosion on the PCB near the usual place next to the battery. I have several used spare PCB's and selected one. Back together, the watch is now working well in all respects. I installed a fresh battery this time around, and the ran for 5 days before the battery went dead. Whats up with this ?? So I got into a movement that has been running on my bench for the last 6 months and robbed the PCB out of it. Installed a fresh battery and the watch ran for about 5 days before killing the battery! 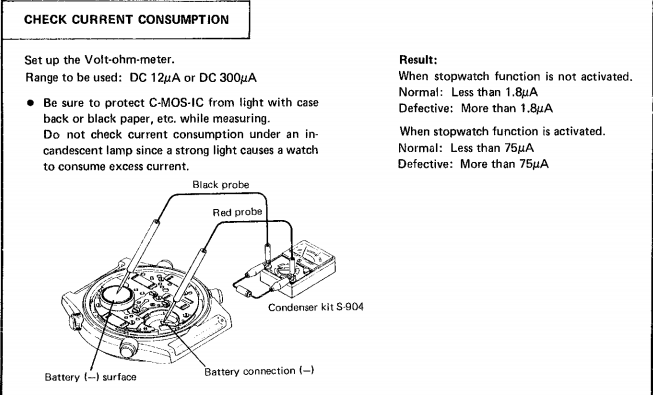 Ok maybe I'll replace the coil that runs the time only because during the last go around I only started the chronograph a couple of times. I tore it down again and robbed the coil out of that good running Mvt... I am getting good at replacing those 7 screws by now ! New coil in, fresh battery. Dead in 5 days......Now WHAT ? Is it friction on the train ? I remember when that 7A28-725A first appeared on eBay, Don - I posted about it in the Finding Hidden 7Axx Gems thread. Here's a bit more history - posted by Stuart Lennard in his My 7A collection from Down Under thread. Thats a bit of history I did not know. This 7A38-725A came from a lot of 3 for repair, still has the case back sticker attached. Has a small scratch on the crystal but overall in pretty top condition. The seller claimed he fitted a new battery, but it did not work. Well he must have installed a dead battery , when I fitted one , everything worked as it should. Stuart didn't actually say how long it worked for though. 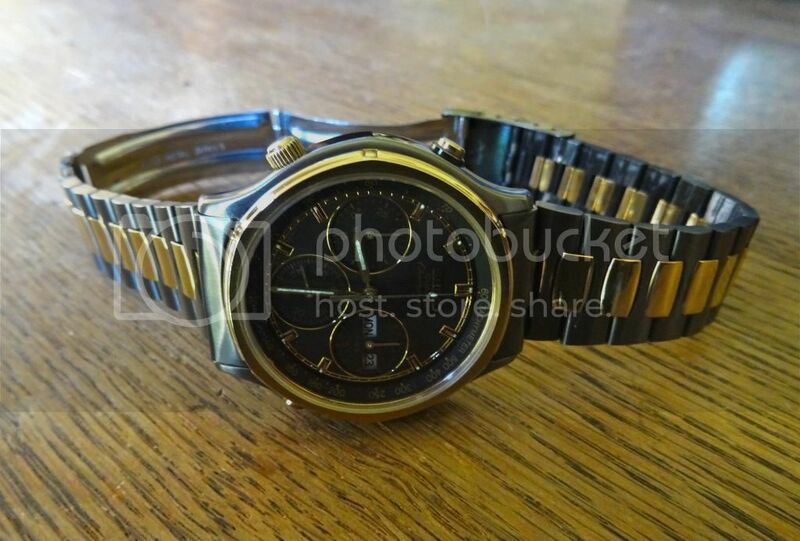 SEIKO 7A38-725A IN GREAT CONDITION. 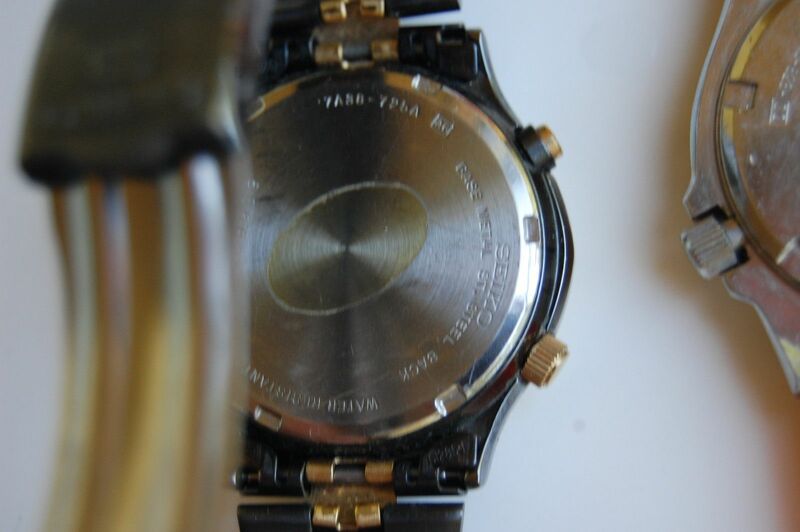 ONLY ONE FINE SCRATCH ON CRYSTAL, A COUPLE OF VERY FINE SCRATCHES ON CASEBACK AND ON ONE GOLD LINK ON BRACELET THERE IS A VERY SMALL WEAR MARK. 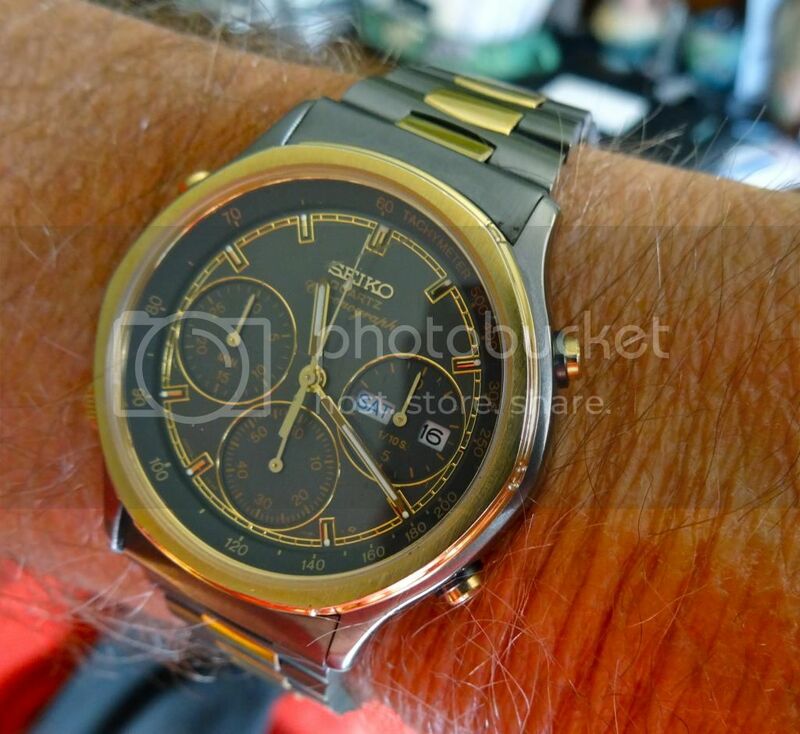 APART FROM THIS THE SEIKO PRESENTS AS NEW. ALL FUNCTIONS WORK AS THEY SHOULD. SORRY BUT DUE TO POSTAGE REGULATIONS I CANNOT SHIP WITH BATTERY. Anyway .... what do you expect for $69 ? Have you checked the current consumption ? See page 11 of the 7A28A Technical Guide. I have not checked with a meter, Paul. But I would assume it is drawing too much current. But where is it leaking? Something is grounding it but not enough to keep it from working for 5 days and remember that last PC board came out of a movement that had been running for 6 months ( same battery ) I am going to pull the coils out of the chrono functions, AND get a strong loupe to look for something ( sliver of metal bleeding off current. 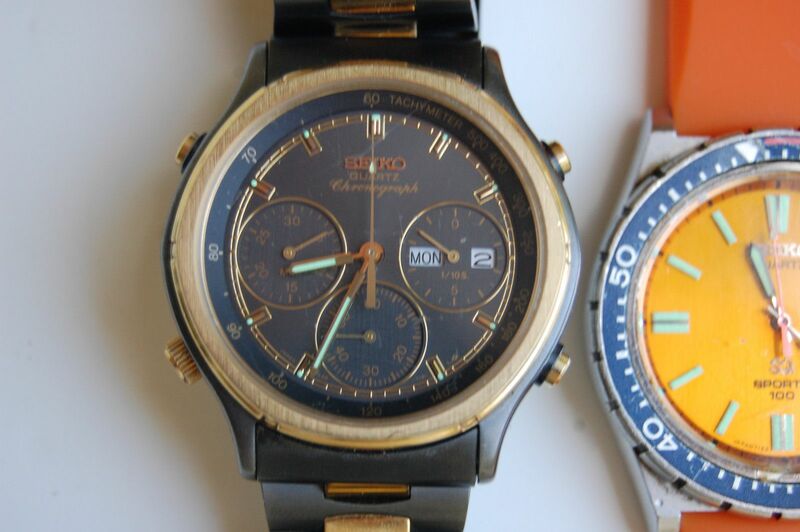 I think I have solved the problem ------> a doner watch from an Italian ebay seller with only one ( 1 ) feedback He says it is untested--If it runs correctly I will swap the movement into the one I have with the battery eating problen.. I will work on the battery eater at a later date In any case I can use at least three links from the band. Can I dare to say, this is a RARE model ? Nah - don't think so, Don. OK I'll take the one on the right You can always replace it I know you are proud of that photo of the three, do you still have three ? No, the one on the right was sold a couple of years back, Don. 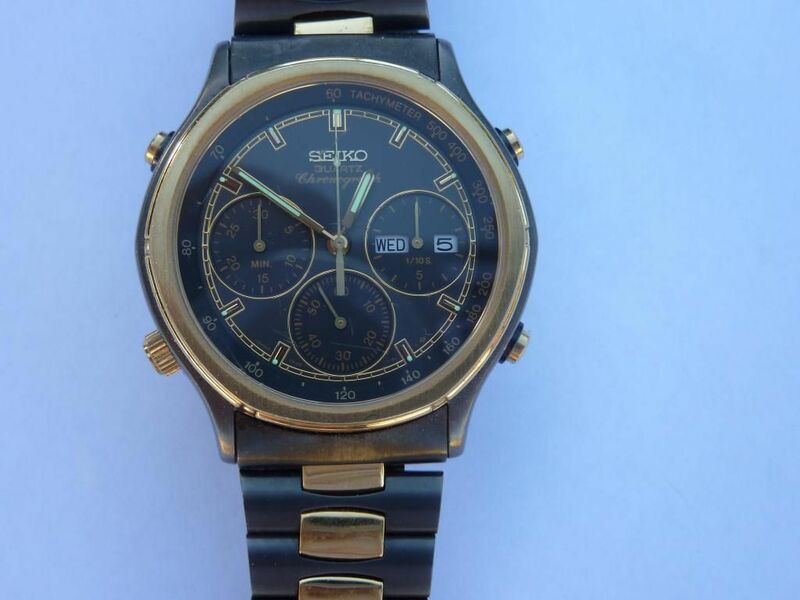 Classic 1988 SEIKO 7A38-725A Quartz Chronograph *RARE* (#230542366381) Rare ? Nah don't believe a word of it.